How cool would it be if you can debug your TV app on a real device! For tvOS all it takes is a provision profile and an USB-C to USB-A cable to connect the Apple TV 4 device with your MacBook. 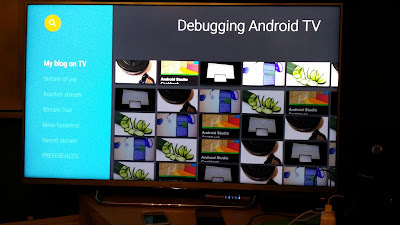 How to enable the debugging option on a real Android TV is less obvious. It starts with selecting the right Android TV device. Android 5.0 set-top boxes are hardly available in my part of the world and getting one from Ali Express is not an option, because the delivery times are too long and I do not have that much patience. So I decided to get myself a TV running on Android. 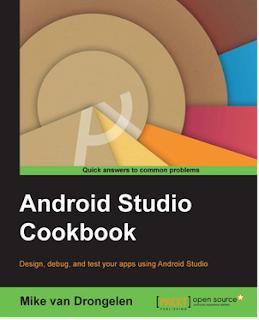 First of all, if you have plans to develop apps for Android TV and want to be able to debug them then it is important to decide which brand and model you pick. Previously I have made the mistake to chose a Philips TV, the 32PFK6500 to be exactly. It was the only 32 inch model that was available, which made it the perfect development TV, or so I thought. It turned out to be not such a good idea. There is no way to debug and test your apps on this or other recent Philips Android TVs, basically because of Philips security policy. Yes, you can unlock the developers menu, but you will never be allowed to connect the ADB. This makes debugging impossible. Too bad! It is a nice TV and I really enjoyed the Ambilight experience. This TV is probably great if you just want to watch TV and use some apps, but it is not really suitable for app development, although there seems to be a workaround to get your app at least tested through the Google Play alpha- and beta distribution mechanism. So I went back to the shop and exchanged the Philips TV for a Sony Bravia TV, the 43W80xC one. With this television I have made a new attempt; this time with success! Just as is the case with Android running on a smart phone, you have to unlock the developers menu first. To do so click the home button on the remote control, go to Settings, choose About and scroll down until you see the Build option. Click seven times on it to unlock the developers menu. The Developers menu will appear under System Preferences. Choose this option and next choose Debugging. Here you can change the setting for ADB debugging to On. I have not found a way for USB debugging yet. It just does not seem to work, although there are multiple USB (2.0) ports available on the device. So lets do this slightly different. 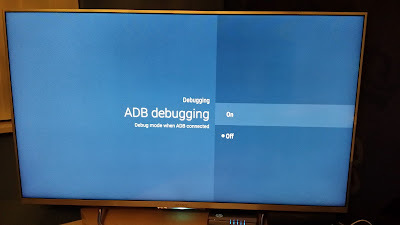 It seems that out of the box the Sony Android TV allows debugging by LAN connection directly. Get its IP address and get connected! Note : Your MacBook (or PC) and the TV have to be on the same network to make the magic happen. Click on the Home button on the remote control and under the Settings section choose Network settings. Next click on Wi-Fi or Wired LAN, depending on how your TV is connected. Under IP address you will see the TV's IP address. Open a new terminal window and connect ADB with the IP address (using the default port 5555) you have just found. If everything went well the result will be something like: connected to 192.168.2.18:5555. At this point the Philips TV earlier returned the message Connection refused. 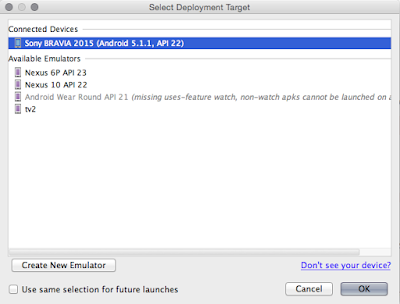 In Android Studio create a new project and choose TV as a platform. This will create a ready made media centre app for you, which you can modify if you want to. 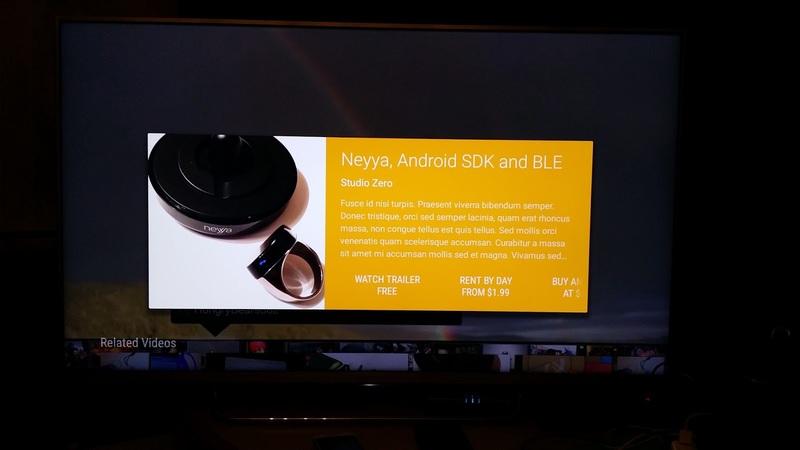 If the ADB connect command did succeed in the previous step and you run your app in Android Studio the TV will be shown under Connected devices. Select it and click on the OK button. The first time the Allow USB debugging dialog will popup. Choose Always allow and click on the OK button to continue. 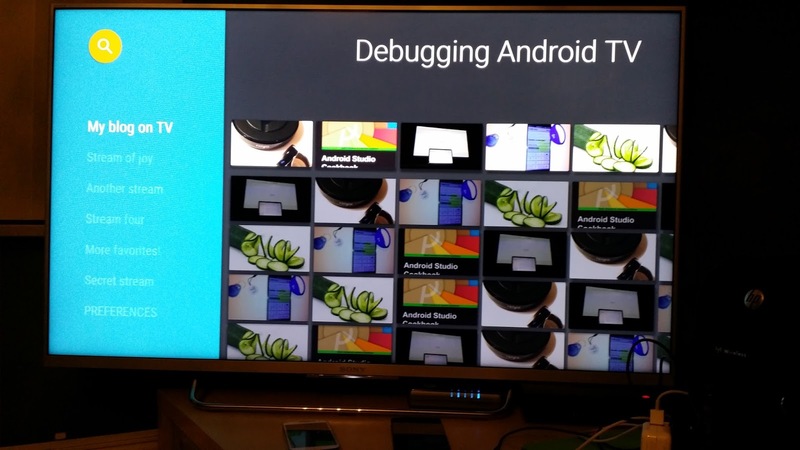 As you can see it is not that difficult to debug your Android TV app once you have the right equipment and know how to configure things. Having everything up and running the next challenge is to create a real cool TV app. My great friend Wim Wepster gave me this interesting Neyya ring. Fortunately it did not come with a proposal. Instead it was a great opportunity to explore Bluetooth and alternative wearables, such as this ring. Neyya is a ring that can send gestures such as taps and swipes to a mobile or another device that is supporting BLE. You can use it for presentations or games, although you can just use your mouse, watch or phone for that as well. So I wondered how it works and what could be an interesting use case for it. 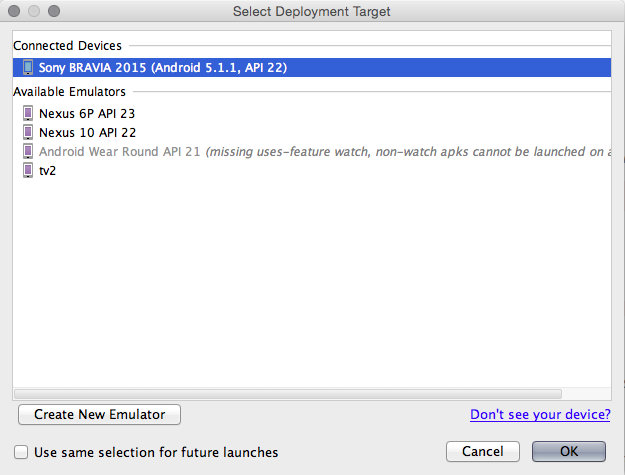 Neyya comes with an iOS and Android app but also with an Android SDK. I was having some troubles with it as it was not able to detect my Neyya ring at all. For the time being (as there must be a more elegant solution for it) I have fixed this by modifying the NeyyaBaseService class within the NeyyaAndroidSDK project. I removed the check to determine whether the Bluetooth device is a Neyya ring or not from the onLeScan method. I did the same thing for the isNeyyaDevice method, like this. Okay, I have to be more careful which Bluetooth device I pick from the list of available devices but at least I am able to continue my journey. Let's connect to the device. Great! but what is it that we are trying to solve here? The supported gestures are taps, double and triple taps, swipe left, right, up and down. 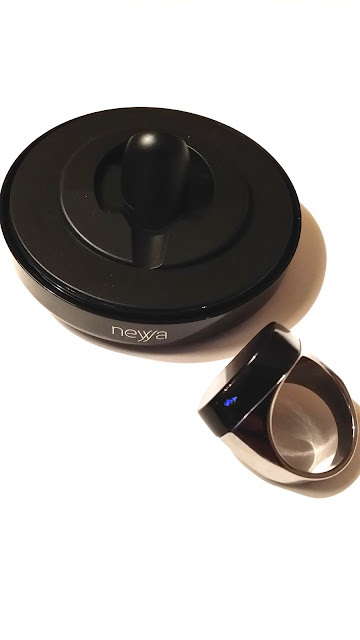 Now, what problem could this ring solve other than the things that come with the Neyya app already, such as capturing a picture, turning the volume of a device up and down and moving to the next or previous song? One of the problems that the Neyya ring could help me with is something that most people will recognize. Your best ideas come up when you are not able to write them down immediately, for example while taking a shower or driving a car. In such cases it would be great to just rub your ring to create an audio note. That is easy to implement. To start recording we will create a MediaRecorder instance and create an output file for it in the m4a format. in the stopRecorder method we will stop the recording. 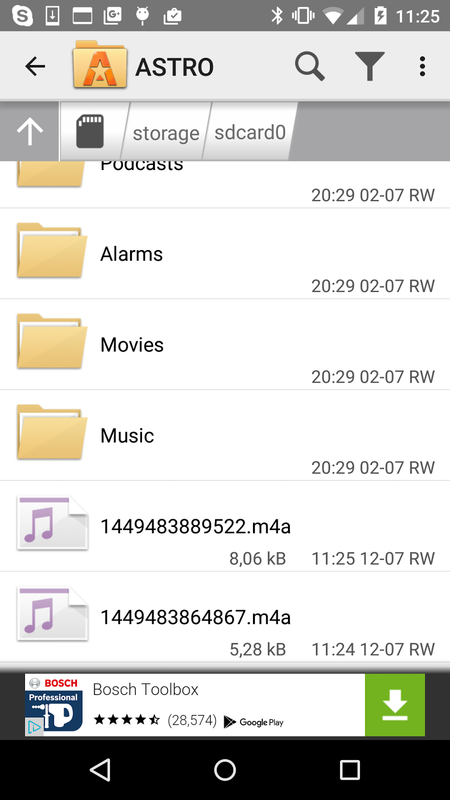 Do not forget to add the right permissions to the AndroidManifest.xml file before you test the app. 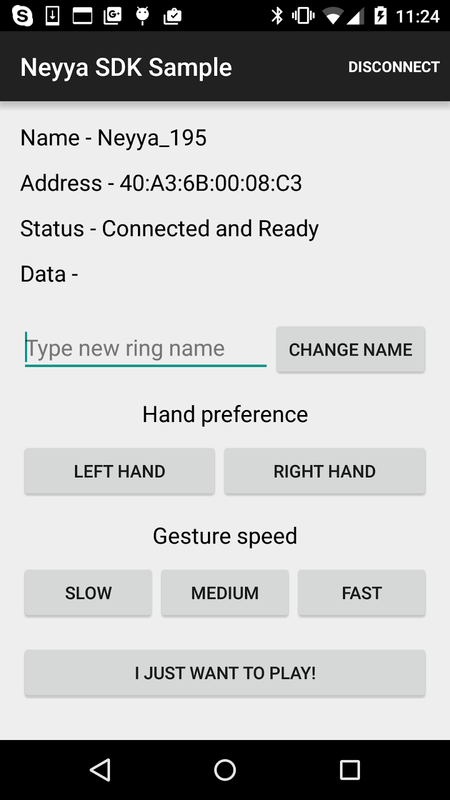 As soon as the app is running and the ring is connected, double tap on it to start recording and swipe up to stop the recording. You can use an app, such as the Astro app, to locate and play the audio file that you have recorded. Later I will release the code of this POC on GitHub. I need to work out the concept a little bit more. 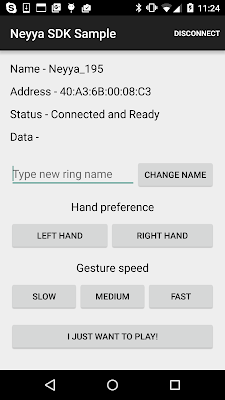 Anyway, I am not fully convinced yet whether the Neyya ring is a useful wearable device or not, but by examing the code I have learned something about Android and Bluetooth and I do have a memo recorder that I can use just anywhere now.